The Amcrest IP3M-941 and the Foscam R4 are the upgraded versions of the Amcrest IP2M-841 ProHD and the Foscam R2 that I compared here last Fall. The comparison of these two cameras is very similar to my earlier one since these higher resolution models are based on the same basic hardware and software, but there are some very noticeable upgrades to these cameras, and some differences between them that might make it easy to choose one over the other for your specific situation. I'll go over the differences between these two models below to help you decide between them, and share which one I might pick for different situations. Keep reading to see which one might be right for you and your application. The Amcrest IP3M-941 uses a 3 megapixel image sensor capable of 2304x1296 resolution along with an unspecified Ambarella processor. I find claims of both 20 fps as well as 30 fps at maximum resolution for this model on the Amcrest web page. I don't know why that is, but can only guess that it has had some improvements since it was initially released. The Foscam R4 uses a 4 megapixel image sensor capable of 2560×1440 resolution along with an Ambarella S2L55M processor capable of 25 fps at maximum resolution. The camera can also operate using 2304×1296 3MP resolution at 25 fps if you prefer. Like the similar 2MP models from these manufacturers, both of these cameras have motors to tilt the lens assembly up and down, as well as pan left and right. This is remotely controlled through each cameras app, allowing you to change the direction the camera is pointing and look around the area where the camera is located. Another feature both cameras have in common is the ability to see in complete darkness by using their built-in infrared LED lights. The Amcrest IP3M-941 has 12 LEDs with a range of up to 10 meters / 32 feet. The Foscam R4 has 13 LEDs, and depending on where you look on Foscam's website, you can find specs for up to 10 meters / 33 feet, as well as 8 meters / 26 feet. I can only assume this is due to a change in design or materials at some point. There are iOS and Android apps for both of these cameras, which I expect is how most people will be using them. 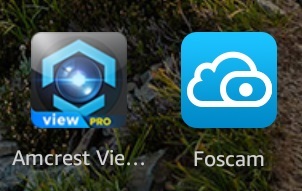 Both manufacturers have full-featured apps that can do the following. Both Amcrest and Foscam are well-known and well-liked companies that have been making cameras for consumers for quite some time now. Both of these models cost about the same and both get good reviews, and I think this is another case where you can't go wrong with either one. Both manufacturers list some conflicting specifications such as the frames per second with the Amcrest, and the IR usable distance with the Foscam. This is a fairly common thing to see from many manufacturers if you dig through all of their material available online, and I wouldn't worry at all about it. This just happens as things change or are improved over the life pf a product and outdated material never gets updated or removed. The Amcrest IP3M-941 is available in silver, and has optional external audio connections as well as 5 GHz wireless connectivity, so if you need those features you'd probably choose this camera. The Foscam R4 has a higher resolution 4MP image sensor and officially supports 128 GB microSD cards, so this might be a better choice if that's important to you.